I’m sure you’ll understand my point of view, We know each other mentally, You gotta know that you’re bringin’ out, The small dog in me. Though this record looks like it was given out in 2005, Brandy is the new world’s smallest dog? This record seems to change every month. Poor Boo Boo and Ducky. Entry filed under: dog, dogs, January 2008, puppy, small dog, small dogs. 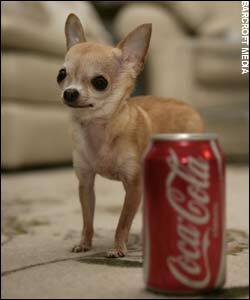 Tags: PetFit Challenege, Weight Loss, World's Smallest Dog. Ooh small dog, I love you so, Never, ever, ever gonna let you go, Once I get my hands on you. There is just one moon and one golden sun, And a smile means small dogs to everyone. FYI Brandy is a beautiful little dog and no one wants to take her title, she is The Worlds Smallest Living Dog in length, and Boo Boo is The Worlds Smallest Living Dog in height. Boo boo will be appearing on the Today Show, This friday morning Jan. 25th to promote the Guinness World Special airing on Jan. 28th on NBC. If you read her story you will see I did not announce her title until I received my certificate. Her name is boo Boo not Dancer. And Ducky did hold the title at 4.9 inches tall until Boo Boo defeated him, measuring 4 inches tall. God Bless Brandy and Boo Boo long may they reign. Thank you very much for clarifying! I will note this in my next post! Q: Do special powers increase the smaller a dog gets? And is this increase exponential?